We know that almost all enterprise-class switches include two or more SFP ports, allowing them to become part of a ring or star-based network topology spread among different buildings, floors or areas, and connected via fiber optic cabling. 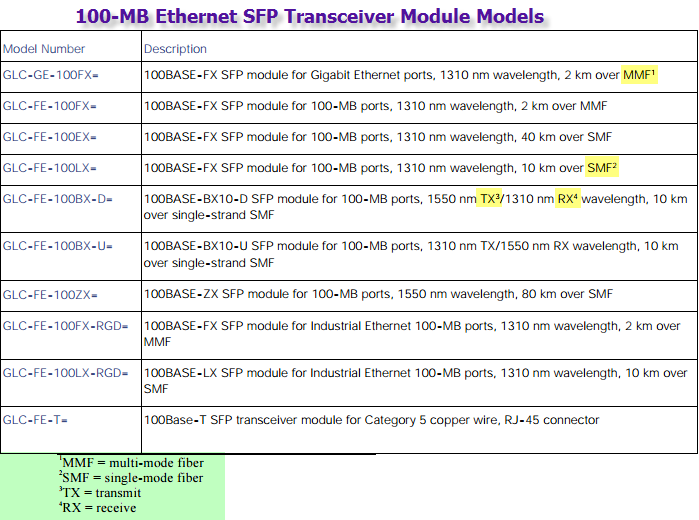 SFPs can be used and interchanged on a wide variety of products, and they can be interchanged in combinations of 1000BASE-T, 1000BASE-SX, 1000BASE-LX/LH, 1000BASE-EX, 1000BASE-ZX or 1000BASE-BX10-D/U on a port-by-port basis. The Cisco 100BASE-X Small Form-Factor Pluggable (SFP) device is a hot-swappable input/output device that plugs into Fast Ethernet ports, dual-rate Fast/Gigabit Ethernet ports, or Gigabit Ethernet ports of a Cisco switch or router, linking the port with the fiber cabling network. The Cisco 100BASE-FX SFP operates on ordinary multimode fiber-optic (MMF) link spans up to 2 kilometers (km) long. GLC-FE-100FX modules operate in Fast Ethernet or dual-rate Fast/Gigabit Ethernet ports of Cisco switches and routers. GLC-FE-100FX-RGD modules operate in Fast Ethernet or dual-rate Fast/Gigabit Ethernet ports of Cisco Industrial Ethernet and SmartGrid switches and routers. GLC-GE-100FX modules operate in Gigabit Ethernet ports of Cisco switches and routers. All these modules are interoperable with industrywide interfaces compliant to the IEEE 100BASE-FX standard. The Cisco 100BASE-LX10 SFP operates on ordinary single-mode fiber-optic (SMF) link spans up to 10 km long. GLC-FE-100LX modules operate in Fast Ethernet or dual-rate Fast/Gigabit Ethernet ports of Cisco switches and routers. GLC-FE-100LX-RGD modules operate in Fast Ethernet or dual-rate Fast/Gigabit Ethernet ports of Cisco Industrial Ethernet and SmartGrid switches and routers. These modules are interoperable with industrywide interfaces compliant to the IEEE 100BASE-LX10 standard. 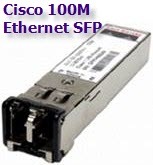 The Cisco 100BASE-BX10 (part numbers GLC-FE-100BX-D and GLC-FE-100BX-U) SFPs operate on ordinary SMF single-strand link spans up to 10 km long. A 100BASE-BX10-D device is always connected a 100BASE-BX10-U device with a single strand of standard SMF with an operating transmission range up to 10 km. The communication over a single strand of fiber is achieved by separating the transmission wavelength of the two devices as depicted in the following Figure. 100BASE-BX10-D transmits a 1550-nm channel and receives a 1310-nm signal, whereas a 100BASE-BX10-U transmits a 1310-nm wavelength and receives a 1550-nm signal. Note in Figure 2 the presence of a wavelength-division multiplexing (WDM) splitter integrated into the SFP to split the 1310-nm and 1550-nm light paths. The Cisco 100BASE-EX SFP operates on ordinary SMF link spans up to 40 km long. GLC-FE-100EX modules operate in Fast Ethernet or dual-rate Fast/Gigabit Ethernet ports of Cisco switches and routers. 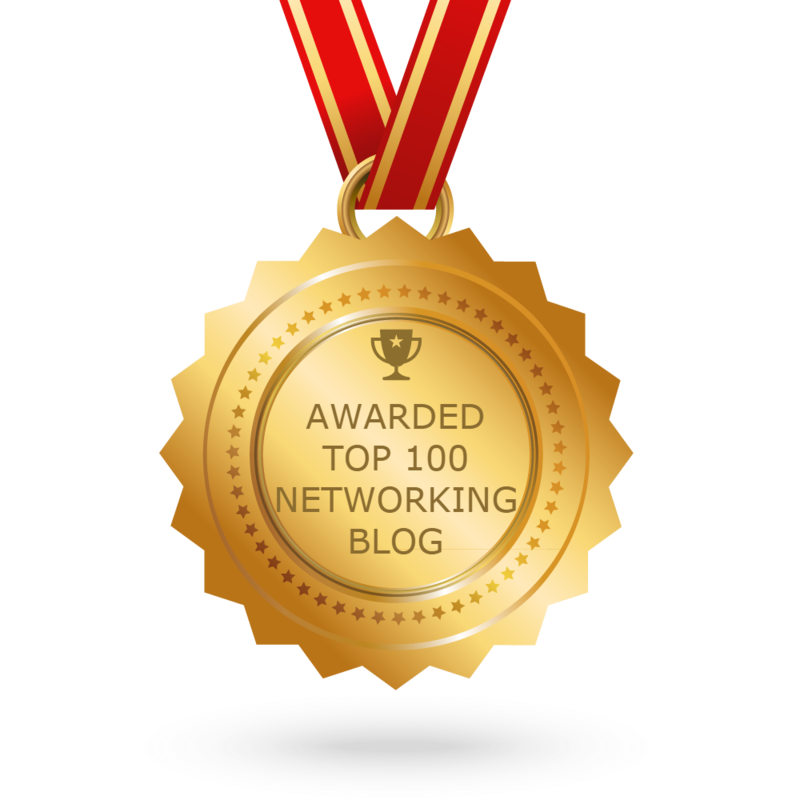 The Cisco 100BASE-ZX SFP operates on ordinary SMF link spans up to 80 km long. GLC-FE-100ZX modules operate in Fast Ethernet or dual-rate Fast/Gigabit Ethernet ports of Cisco switches and routers. The 100BASE-T SFP operates on standard Category 5 unshielded twisted-pair copper cabling of link lengths up to 100 m (328 ft). It supports Industrial temperature range of -40 to 85C. The Cisco SFPs are supported across a variety of Cisco switches, routers, and optical transport devices. 7 Supported in SFP ports (1 and 2) only; not supported in SFP+ ports (3 and 4). *This model is supported on Cisco IOS Release XE 16.2.1 and above only.